The Monarch butterfly is a stunning mix of grace and beauty. With their trademark rich warm colors, they fly across the landscape and take over the job of pollination. The Monarchs that visit Pismo Beach are a unique species. 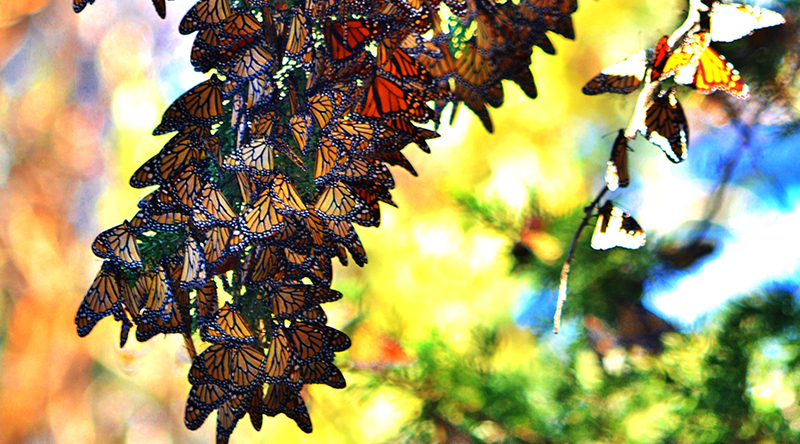 Their life span is a long six months, in comparison to common Monarchs who only live six weeks. They have a unique fat-storing system that makes this longer lifespan possible. However, even with these abilities, these butterflies that leave Pismo Beach in March will never return. Butterflies that visit Pismo Beach also have never been there before. Some scientists speculate that the insects are equipped with genetic honing devices, that enable them to return to the same wintering spots, year after year. In North America, butterflies consistently return to specific areas along the Central and Southern California Coast down to Mexico. Their fascinating migration returns to the Pismo coast every winter, and is a one of our favorite sights along the Central Coast. On this special day, why not visit The Grove!? It’s located on the west side of Highway 1, just south of the North Beach Campground in Pismo Beach. Again, State Beach docents will host the Western Monarch Day Celebration at the Pismo Beach Monarch Butterfly Grove from 10 a.m. – 3:30 p.m. Saturday, Feb. 2. There will be butterfly talks and educational booths for adults, as well as art activities for the kiddos. Seeing thousands of butterflies nestled in clusters at the tops of high eucalyptus trees is truly an amazing experience. Don’t miss out this weekend!